This was a pretty big weekend. Cadillac took our son up to Boy Scout camp. It was not what Cadillac would really call camping, because they stayed in a heated cabin with its own shower and fridge. Cadillac does not consider it real camping unless he has a 40 pound rucksack and has to drink water off a toad’s back, or something. “I’m off to learn how to be a man,” the Boy said as he shouldered his backpack. While there, Cadillac impressed everyone with his survivalist skills and made a hammer in his downtime with only his BARE TEETH and a 1000 foot tall endangered redwood tree he tore out of the earth with his toes. He said that many kids played with it. No one got hurt, as far as I know. Except for Little Girl, who tried to bash in a cupboard and dropped it on her toe after her daddy got home. Meanwhile, the girls and I hosted a Boy Scout’s sister for the weekend. On Saturday, first, I nearly PERISHED because Cadillac had promised to make me coffee ready to go in the pot and he didn’t have time, so I had to make my own coffee which was disastrous and full of grounds. I had to make it all over. Cadillac loves to make my coffee and he also likes to say I’d DIE without his ability to make it. Then we went to the Zoo and looked at the elephants and walked all the way around because Little Girl has been scared into non-Skyfari compliance by her brother. Anyway, one of my fantasies is making my own Hummingbird Garden, except maybe with no birds in it because I know I’d be the one cleaning up the poop. ‘Course, if you’re rich enough for such a garden, then surely you can hire some folks to take care of your birds, no? 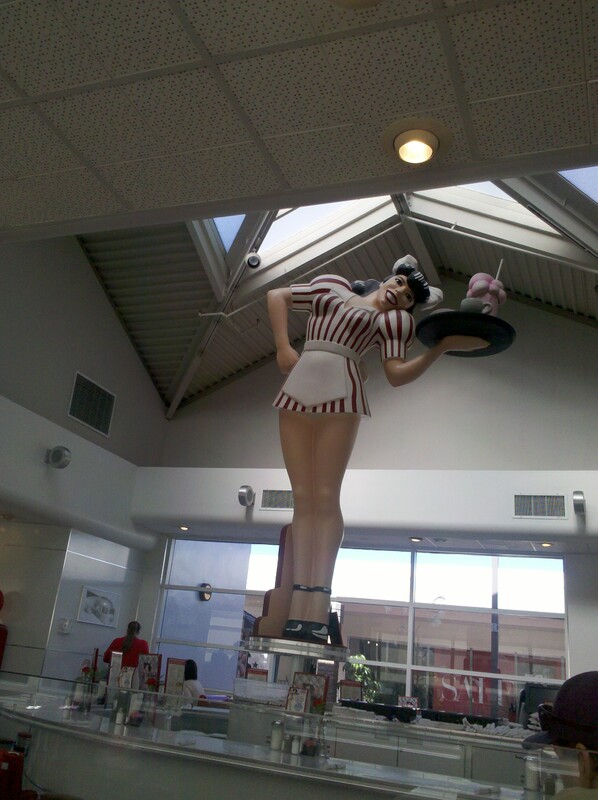 Afterward, we went over to Ruby’s Diner, a kitschy burger place where waitresses dress in red and white pinstripes and where there is a GIANT LADY rotating her wares off to the side. It reminded me of this even more GIANT STATUE by the water, except the WWII statue is outdoors and slaps you in the face with its gaudiness. I had to nearly literally wrestle kids’ menus off the hostess, who did not provide them when we were seated (yeah, I’m still bitter about that. It’s $4 for a kids’ meal vs. $9 for an adult meal, and the hostess merely told me to look at the adult menus on the table when she seated us). I swear, I do not get good service from women unless Cadillac is with me. I promise I smile and am friendly. The other exciting thing that happened was a woman almost ran into my car on the way there. She’d pulled up to a stop at a red and I was making a right when suddenly she decided to turn right and came within (literally, not almost literally) an inch of my car and did not have the courtesy to wave. Afterward, we went over to the manga store across the street, where Eldest amused herself by circling around about 600 times without picking up a single item. Then I went next door to fortify myself with caffeine and when she came out, she had bought herself a lion cartoon character based on an Adult Swim cartoon she’s not allowed to watch. I just looked it up; it’s called Bleach and apparently someone or other’s soul has to reside in the stuffed lion. Pretty sure she doesn’t know that; she thinks it’s a cute lion, but also sure it wouldn’t faze her considering all the Harry Potter horcruxes we’re used to. Then we returned home. Turns out Eldest had not slept on Friday, not really, having insisted on sleeping out in the living room, so she bonked out for quite some time. Her friend became concerned about how long she’d sleep and we were not sure. I thought the weekend was shot; her friend was getting tired of hanging out with a kindergartner, but finally Eldest rallied and emerged from her room to complain (!) of boredom. During this, we took all our rolled-up socks and had a war. Me against them. At some point, Little Girl was heard to yell, “GO TO THE KITCHEN! GET THE KNIVES AND PANS!” which is entirely what I would expect of her, who used her stroller as a battering ram in a similar fracas at the age of 3. Then the girls wanted to remake TWILIGHT using only them as actors, which degenerated into me as Jacob, Little Girl as Bella, and the Cat as Edward. This degenerated even more into shots of Little Girl stroking the cat’s head and saying, “Oh Edward, I sure do love you!” and which Eldest promptly erased. 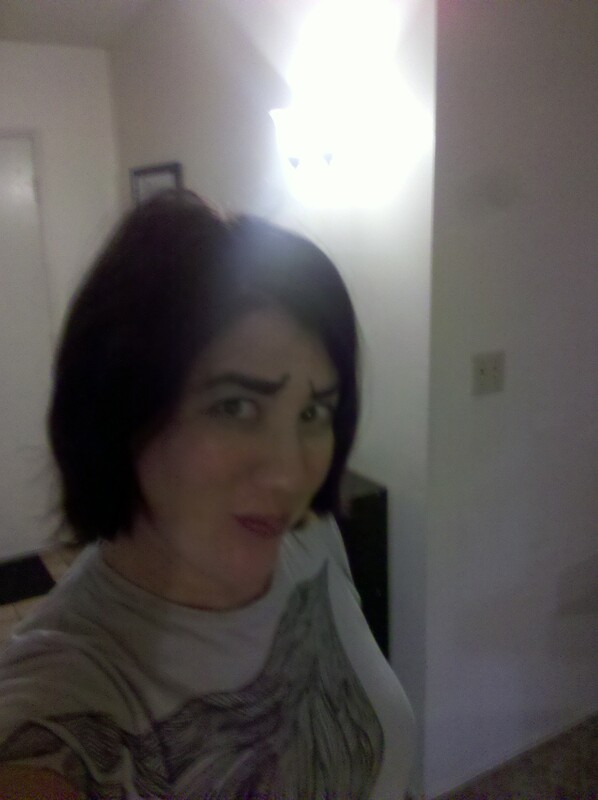 I then proposed we take our two large exercise balls and have a SUMO MATCH. We put pillows in a circle and had to knock each other out whilst holding the balls in front of us like giant bellies. That Twilight video should be on You Tube. We love Ruby’s. Although the customer service has been lacking a bit.